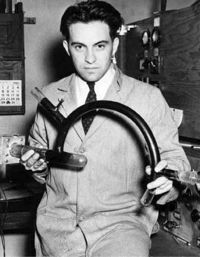 Alfred Nier (1911 - 1994) was an American physicist. Nier was a pioneer in the field of mass spectrometry. Using a mass spectrometer of his own design, Nier produced a sample of uranium-235 to be shipped to John Dunning's team at the University of Columbia, at Enrico Fermi's request. In doing so, Nier's team also showed that the uranium isotope responsible for nuclear fission was uranium-235 rather than uranium-238. He later worked at the Kellex Corporation to develop mass spectrographs that were used for the production of the American atomic bombs. 1911 May 28th Born in St. Paul, Minnesota. 1940 Produced a sample of pure U-235 using mass spectrography. 1943 to 1945 Developed spectrographs at Kellex.